Nipun Mehta is the founder of ServiceSpace.org, a fully volunteer-run organization that has delivered millions of dollars of web-related services to the nonprofit world for free. The recipient of the Jefferson Award for Public Service, the President’s Volunteer Service Award and an honor from the world’s most famous clown, his work creatively leverages web technologies for collaborative and transformational giving, lending him insight into service, leadership, organizational design, and spirituality. He serves on the advisory boards of the Seva Foundation, Dalai Lama Foundation, and Airline Ambassadors. Nipun’s high-school goal was to either become a tennis-pro or a Himalayan Yogi. However, by the third year of his Computer Science and Philosophy degree at UC Berkeley, he started his software career at Sun Microsystems. 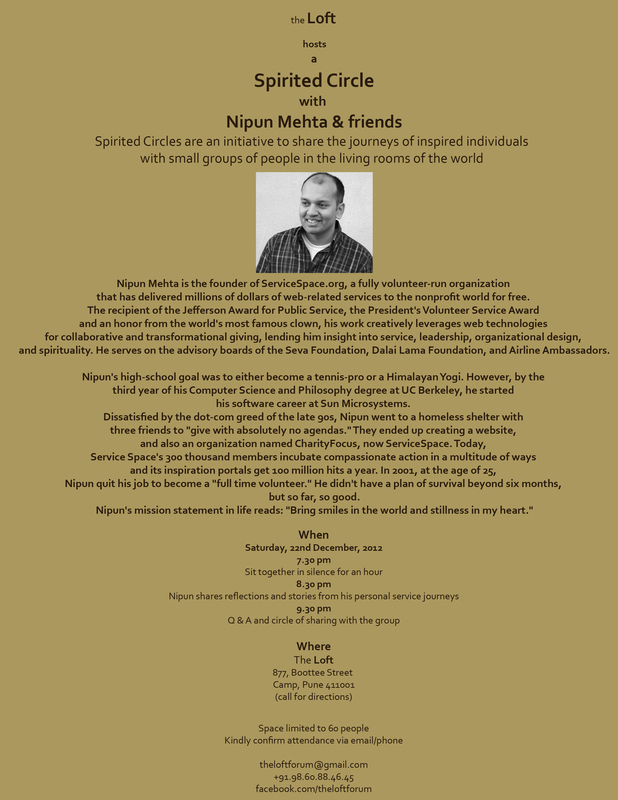 Dissatisfied by the dot-com greed of the late 90s, Nipun went to a homeless shelter with three friends to “give with absolutely no agendas.” They ended up creating a website, and also an organization named CharityFocus, now ServiceSpace. Today, Service Space’s 300 thousand members incubate compassionate action in a multitude of ways and its inspiration portals get 100 million hits a year. In 2001, at the age of 25, Nipun quit his job to become a “full time volunteer.” He didn’t have a plan of survival beyond six months, but so far, so good.